Footprints is a network of interactive objects for creating and sharing illustrated stories between parents and children. The project aims to involve parents in their children’s everyday lives by sharing an intimate moment like telling a story. It is especially conceived for modern working parents, often busy, who are away from family life and find it difficult to follow their children’s growth and development. The network comprises a smartphone application, for the parents, and an interactive puppet which interacts with a tablet application, for the children. The system is designed to take place in the parents’ and children’s daily environments. So the parents use the application at work, for example during a five-minute break. Similarly, the children use their puppet during school time, in the school’s play area. 1 -> The communication process is started by the parent. With the smartphone the parent can record a little vocal story, add some images proposed by Footprints about the story he or she has just told, typically the story’s characters or other objects related to it. The parent can then send it all to the child’s puppet. 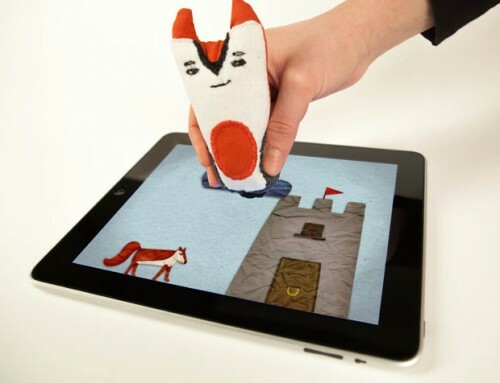 2 -> At school, the child can listen to the story by placing the puppet on the tablet and play with the images he or she has received to build a drawing about the story. 3 -> Once the drawing is complete, Footprints send it back to the parent who can track the path of the stories shared with the child through the smartphone app which, in time, collects and documents all the drawings. The smartphone app, the first step of the process, is designed for the parent. 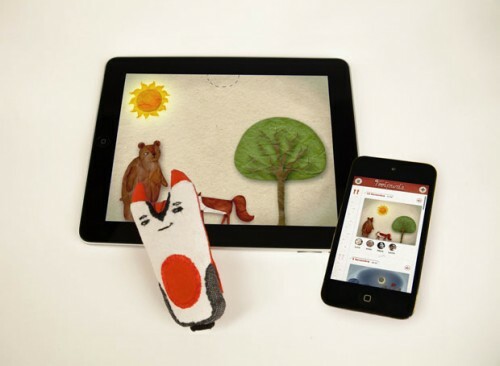 With it the parent tells and records a short vocal story, adds images related to the story which are provided by the app, and sends it to the child’s puppet. Navigating the app the parent can also browse all the drawings already received from the child, which are displayed chronologically on the home page, documenting the whole exchange. The puppet is the child’s special toy. It receives the story sent by the parent and creates a drawing based on the story he or she has just heard. The child interacts dynamically with the story through the tablet’s screen by picking the images up, storing them inside and releasing them on the screen. It is a child’s trusted friend, someone special they can take care of and carry during the day, even if it only activates in the school’s play area so as not to interfere with other school activities. Below is the full report, in Italian but with an abstract in English. Discover more about Footprints on the dedicated project site or my online portfolio.